DNA polymerase. The thermostable DNA polymerases have a high temperature optimum but they are not completely inactive at room temperature, and this can lead to elongation of misannealed primers or excessive primer dimer formation. These low-temperature products can be avoided by hot-start PCR: An essential component such as polymerase or magnesium solution is added only after the ''initial template denaturation'' step, during the ''primer annealing'' step (Tables 2 and 3). Another, more convenient option is the use of inactivated DNA polymerase enzyme (commercially available, using heat-labile chemical modification, e.g., from Qiagen; or by antibodies, e.g., from Roche Diagnostics). The enzyme activation requires an extended heat treatment and, for this purpose, the ''initial template denaturation'' at 95°C can be extended to 10 min. Increased efficiency and specificity: 1-10% glycerol, or nonionic detergents such as Tween, Nonidet, CHAPS, Triton aA surplus of free Mg + is required. Therefore higher dNTP concentrations require higher Mg + concentrations. are hybridized to an immobilized capture probe (on membrane or paramagnetic beads), followed by hybridization with a labeled detector probe, stringent washes, and detection, as described above. This means that the nowadays fully automated and straightforward PCR is complicated by these extra steps after PCR completion, which include the risk of spreading the multimillion-fold amplified DNA segment. If high numbers of samples are analyzed in parallel, laboratory contamination can lead to many false-positive results. Therefore in routine diagnostics, conventional PCR is now widely replaced by sequence-specific real-time PCR techniques (see ''Real-Time PCR Technology''). Exciting applications in molecular biology derive from the use of composite primers (principle in Fig. 3), combining a 3'-terminal segment with the usual target-specific primer sequence and an unrelated 5' track that can introduce functional DNA sequence recognition sites. Examples are cleavage sites for restriction enzymes in cloning applications, or a promoter sequence of an RNA polymerase for the production of large amounts of PCR-designed RNA transcripts, useful for in vitro translation, RNA processing, tRNA charging, ribozyme studies, etc. 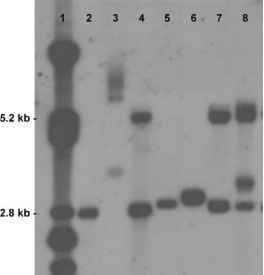 For cloning applications, it is important to keep in mind that the most widely used thermostable Taq DNA polymerase has an error rate of about 1:1000. If the PCR-generated mixture of millions of amplicon molecules is used directly (e.g., in sequencing, or for the generation of RNA transcripts), the mutated molecules can be ignored. However, if PCR products are cloned, these clones are derived from individual amplicon molecules. This means that, if only one clone is analyzed, the derived sequence can have one or several mutations. Therefore multiple clones have to be sequenced, and a functional PCR construct (e.g., for overexpression of a protein) with the correct sequence has to be selected.